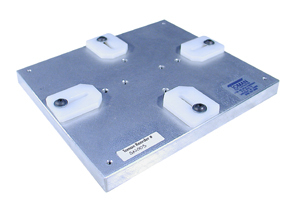 The Universal Fixture Plate can save money in fixturing costs. It will accept parts of various shapes for welding, inserting, or staking operations and is suitable for short or long run production. Parts from 1/2″ x 1/2″ up to 6-1/4″ x 7-1/4″ can be accommodated on the plate. The plastic locating blocks will not mark the part. Fixture mounting holes are predrilled. Overall dimensions are 9″ x 8″ x 3/4″ thick. It comes standard with 1/4″ plastic locating blocks. This ninety shore, 1/32″ thick, silicone rubber is laminated to an 1/8″ aluminum plate to be used with the Universal Fixture Plate. It will resist temperatures of up to 500 degrees Fahrenheit and prevents marking on the surface of the part that touches the fixture. It covers the entire surface of the Universal Fixture Plate, and all holes are predrilled for mounting. These blocks offer more stability on a thicker part. Comes in a set of four blocks with extra long screws. Excellent for a quick fixture set-up. Conforms to part from 1/2" x 1/2" to 6-1/4" x 7-1/4"